Beach tags- a practical way for seashore communities to off set the cost of maintaining a beautiful and safe beach. The expense is shared by tourists and residents alike. Seasonal tags purchased before May 27 cost $21 each ($26 after); weekly tags $12; daily $6. Tags are reciprocal between Avalon and Stone Harbor, and required for those over 12 years old. Beach tag booths open daily: 30th and Avalon Avenue; or 95th and the beach. 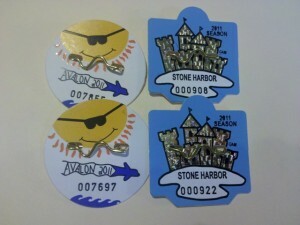 Tags can also be purchased from the inspectors on the beach all summer. This entry was posted in Avalon, New Jersey- News, Stone Harbor, New Jersey- News. Bookmark the permalink. Post a comment or leave a trackback: Trackback URL.